Canadian dealers in seven key launch markets started taking orders for the all-new 2012 Chevrolet Volt this week. Carrying an MSRP starting at $41,545, General Motors says the Volt is the industry’s first electric vehicle with extended range capabilities. “Unlike other electric vehicles in the market, the Chevrolet Volt will never leave anyone stranded with a depleted battery,” the company said in a release. 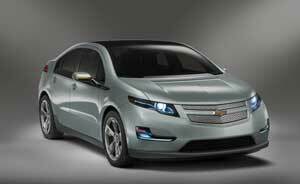 The Chevrolet Volt was recently named 2011 World Green Car of the Year at the New York International Auto Show. Prior to receiving this honour, the Volt had already captured many major awards in North America, including North American Car of the Year; Motor Trend 2011 Car of the Year; AUTOMOBILE Magazine 2011 Automobile of the Year; and Popular Mechanics 2010 Breakthrough Technology. Needless to say, the General has high sales hopes for the Volt. The Volt will initially be available to retail customers in the marketing areas for Vancouver, Victoria, Toronto, Oshawa, Ottawa-Gatineau, Montreal, and Quebec City in the third quarter of this year. Within twelve months of the retail launch, Volt will be available at dealerships nation-wide. It will be offered in one very standard trim level and have two option packages: a premium trim package and a rear camera and park assist package. In terms of warranty, Chevrolet is offering an eight-year/160,000 km limited warranty on the Volt’s 16-kWh lithium-ion battery. There is also three-year/60,000 km bumper-to-bumper coverage; five-year/160,000 km roadside assistance and courtesy transportation; five-year/160,000 km limited gas engine coverage; and six-year/160,000 km corrosion protection coverage.